Life happens. Injuries occur. It’s likely you’ll have the need for a personal injury lawyer at some point. You may have gotten hurt on the job. Maybe you were in a car accident, or you could have hurt yourself slipping on a wet floor. Slip and falls are one of the leading cause of injury in Missouri and Kansas including the Kansas City area. These falls can lead to severe injuries and sometimes even death. 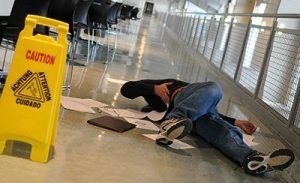 These slip and fall injuries are usually the result of an unsafe condition on someone else’s property. All property owners have a responsibility, by law, to use reasonable care to maintain a safe environment. They must inspect their property for risk factors that could reasonably endanger others. If any risk factors do exist, these property owners have a responsibility to make the necessary repairs that are needed. If you are injured by a dangerous condition on someone else’s property, you may be entitled to compensation. You were insured properly, but for some reason the insurance company decided to not fulfill their commitment. As you began to seek reimbursement, you continually received pushback instead. This is extremely common. Insurance companies will always try to pay as little as possible. They will double-check to make sure every one of your expenses is valid. Make sure you keep all documentation and receipts of anything related to the injury. If documentation isn’t enough and the insurance company is continually giving you trouble, you need to seek the help of a personal injury lawyer. Choosing a great personal injury lawyer helps ensure your case gets settled in the best manner for you. Do your homework when looking for an attorney. Ask family, friends and associates if they have a recommendation for a personal injury lawyer. Google around and research personal injury lawyers in your area. Call your state’s bar association and ask for recommendations. Check with a lawyer referral service. When doing your research, you’ll want to look for a personal injury lawyer with experience. You want to find an attorney who has an established record in both trial and settling personal injury cases. Once you have a few potential attorneys selected, you will want to interview each one before deciding who is the best fit for you. Most personal injury lawyers offer a free initial consultation. Use this consultation to ask questions and discuss costs. You’ll want to find out exactly how much hiring each lawyer you interview will cost you. Once you have the pricing from each lawyer, you’ll want to have terms in writing from the lawyer you select, Make sure you request the terms of pricing in writing before you sign anything. Price is always a factor, but make sure you find a lawyer you feel comfortable with. You must be able to openly and honestly discuss your case with any lawyer you choose. If you’re in need of a personal injury lawyer in Kansas City, we hope you’ll contact us. Here at Paulus Law Firm, we strive to be the best personal injury lawyers in Kansas City and all of Missouri. If you are dealing with any issue involving an injury, please reach out today. If you have had a slip and fall accident, please contact us at Paulus Law Firm at (816) 237-8502 for a free consultation.